Exploring the Distillery District and Harbour Front is one of my favorite things to do in Toronto, mostly because there is so much to see, and it changes every time I go. We attempted to save this exploring day for a nice and sunny one, but we weren’t so lucky; it was sunny, but mixed in with huge rain clouds and extremely muggy weather. We did however manage to have an excellent time, and missed out on the rainy bits! This is an all day itinerary: you can spend the entire day walking around the water front and still not see everything! Just to give you an idea, in 1972, Pierre Elliot Trudeau’s government decided to make use of the industrial wasteland that used to be in the Harbourfront location and revitalize it into a cultural, educational, and recreational spot. Well, it is today one of Canada’s most visited cultural sites, and it hosts a multitude of events, shows, summer camps, etc. every year. You’ll find some art studios that you can walk in and see artists in action, some cultural events in which you can participate, and overall fun for everyone. As for the Distillery District, the old Victorian Industrial buildings were restored into a mix of old architecture mixed in with 21st century design, combining the “romance and relaxing atmosphere of European walking and patio districts with the hip, cool dynamic of an area like New York City’s SoHo or Chelsea, where creative minds get together and you feel as if anything could happen”. And the vision the developers had has definitely come to life. You walk through cobblestone alleys and are surrounded by beautiful old buildings that have been renovated to perfection. Inside each and every one of these buildings you have a clear vision of what it used to look like, but also that brand new feel. You’ll find many interesting shops along the way, as well as some must stop restaurants and cafés. You can even rent a Segway to tour the area, but be aware… Segways and cobblestones don’t seem to get along, at least in my mind! 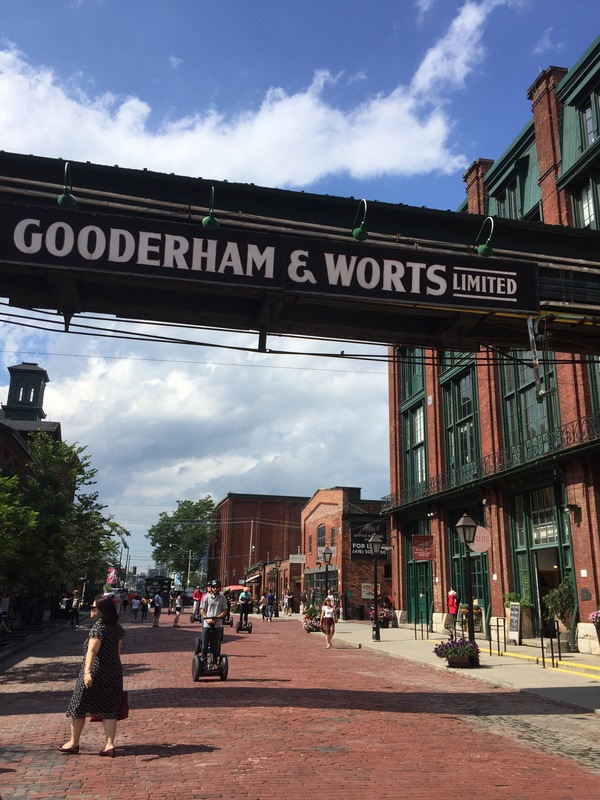 Here are a few of our favourite stops and shops along the Distillery District and Harbourfront! Locally made, these soy candles are some of the best candles that I’ve seen! They offer scented (my two favorites: baked spices and satsuma chaï) in various formats as well as unscented ones in every color and shape imaginable. Seeing the size and quality of these candles, I was expecting to shell out a good 30-40$ for a candle that burns about 72h (MASSIVE CANDLE). Turns out, I only had to cough up 15$! The prices are amazing and the scents are just right, not overly powerful. You’ll also find candle accessories, and candles shaped as skulls and cats. Yep. We’ll have seen it all! Established in 2003, this small chocolate factory has become a staple to torontonians. They first started in the Distillery District roasting cacao beans and creating their own chocolates, gelatos, cookies, hot chocolates, and truffles. This has expanded to a second store in Toronto, as well as a network of wholesalers. If you can get your hands on some SOMA chocolate, DO IT! They have the most intricate and beautiful patterns on the backs of their bars, and they offer up an incredible amount of flavors and types of chocolates, as well as creative combinations for their truffles. We walked out of the store with four different types of chocolate bars (two or three dark chocolate and one milk) decorated with candied ginger, candied orange, roasted coconut, and hazelnut. Their spicy hot chocolate mix has also been one of our favorites. Hey SOMA! When are you coming to Montreal?! I’m kind of biased when it comes to Mill St., seeing as I’ve worked for their Ottawa location. No matter what, it is a must stop for all you beer lovers out there! It is actually East Toronto’s first commercial micro-brewery to open in more than 100 years, and they still produce small batches of seasonal beers right on the spot! You can go in, grab a bite and sign up for a tour of the distillery on a daily basis, as well as stop by their retail store on your way out to grab a pack of beers or merch. The food is all about beer, and uses many locally sourced ingredients to offer you the best of the best. Pro tip: try out their beef dip or their flatbreads, they have been two of our favorites. They change their menu up every so often, which allows them to showcase their seasonal beers perfectly. Beer wise, you can now find them at the LCBO and SAQ, but don’t be shy to ask for advice! Their staff is trained to be able to help you make a choice according to your personal tastes and use your favorite beers as a benchmark. You’ll be able to find so many daily activities and events for every age group. Make sure to check their website frequently in order to catch all the cool things happening. Stop by the Sugar Beach for a picnic to sit under pretty pink umbrellas and enjoy the scenery of the one of the Great Lakes. 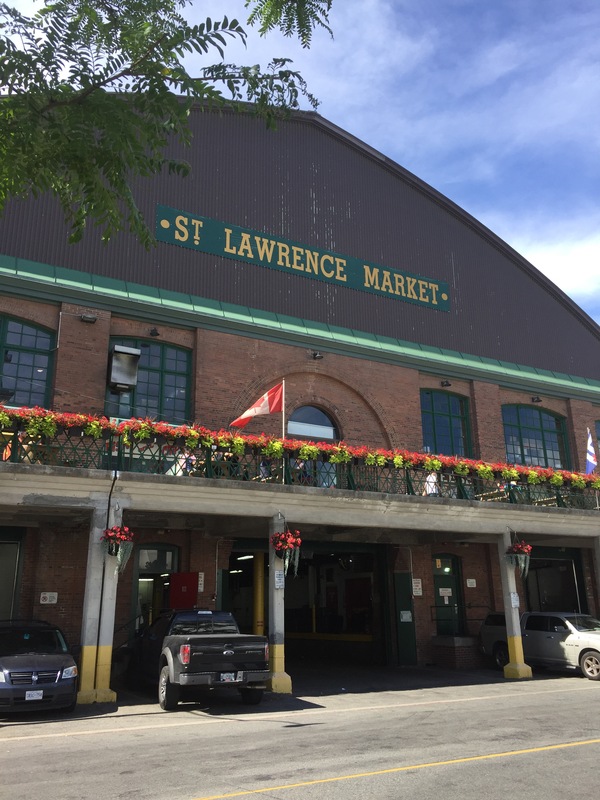 First starting as a farmers market sometime around 1803, what we know as the St. Lawrence Market has evolved into a huge building where local farmers, butchers, cheesemongers, fishmongers, and so much more, get together to offer us some of the most amazing and delicious foods. 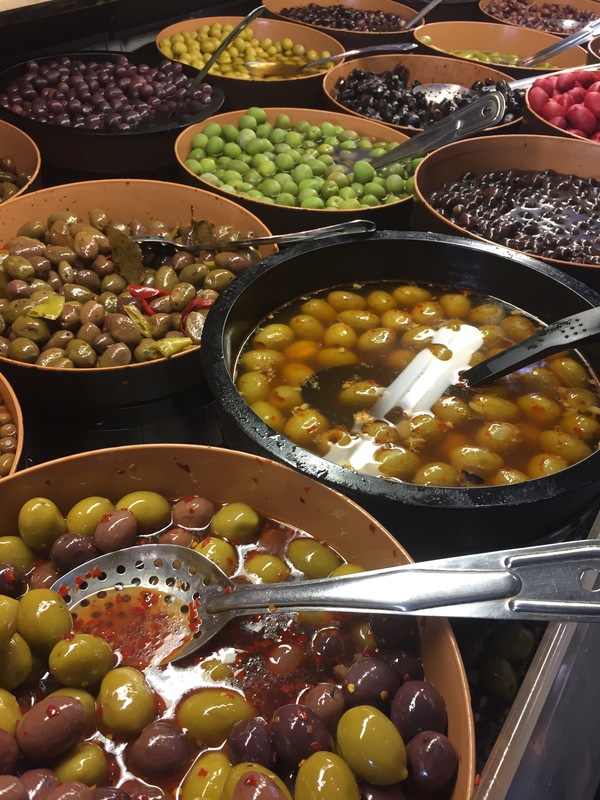 You can go and grab some cheese, olives, and readymade snacks for your trek along the harbourfront, or do your weekly shop at the stalls. You can find anything, and we mean it! We found crocodile meat sliders, camel sirloin, red olives, stinky cheeses, and a complete octopus the size of a basketball. 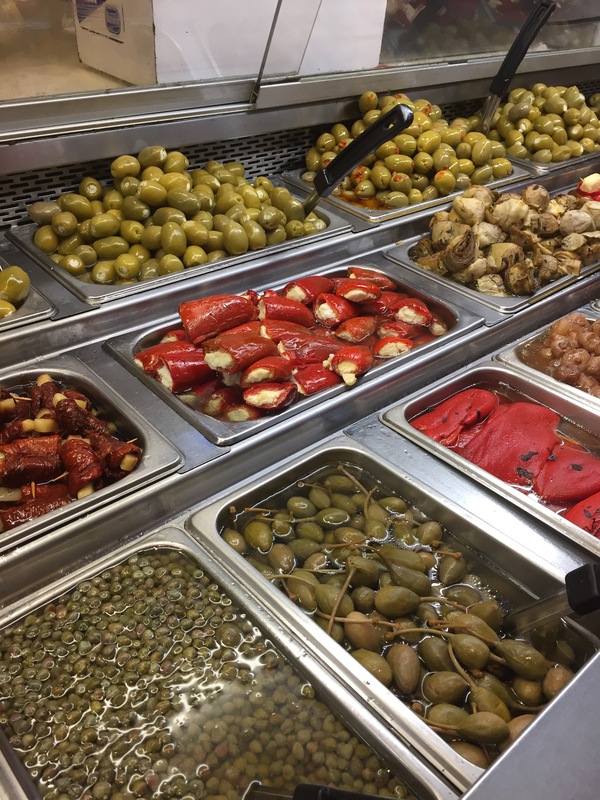 Everything looks delicious, and everyone working there is pleased to answer any questions you may have. Oh! Check it out on Sundays when they have their antiques market; you’re bound to find something interesting! I had seen this on someone’s Facebook page, but it took us completely by surprise when we stumbled upon this very “interesting” fountain. 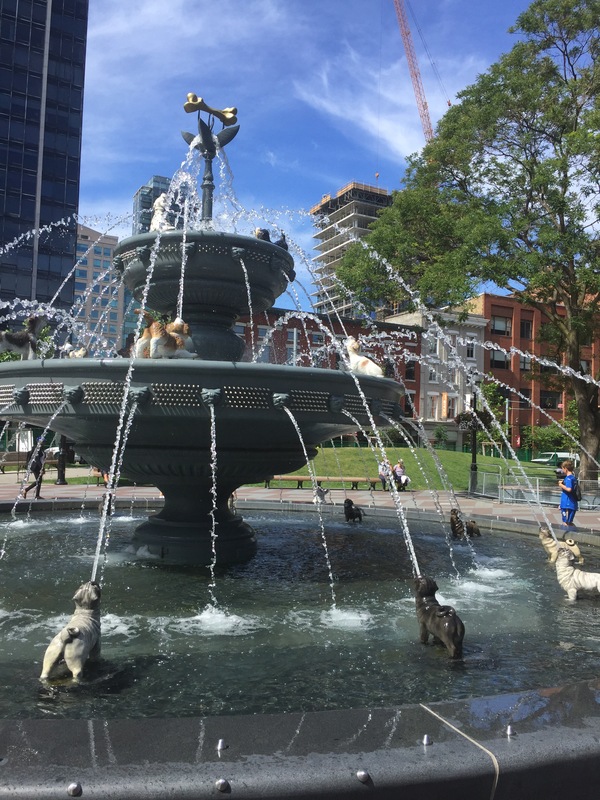 The fountain itself is beautiful, but it has been upgraded to have statues of dogs spouting water? Funny thing. One big German Sheppard wasn’t too sure about the bigger dogs spouting water, so he went around sniffing their butts… We had a good giggle! And soooo many people were taking selfies with their real dogs and the fake ones. It’s a pretty fun thing to see, and the park is perfect to sit and have a bite to eat in the sunshine! There is still so much to see and do! You can catch a Blue Jays’ game, go up the CN Tower, or even visit Steamwhistle’s brewery, and still not be done!